Marking the company’s return to basketball in a big way, Puma announced the signing of Deandre Ayton, the No. 1 pick in the NBA Draft, to a multiyear endorsement deal. 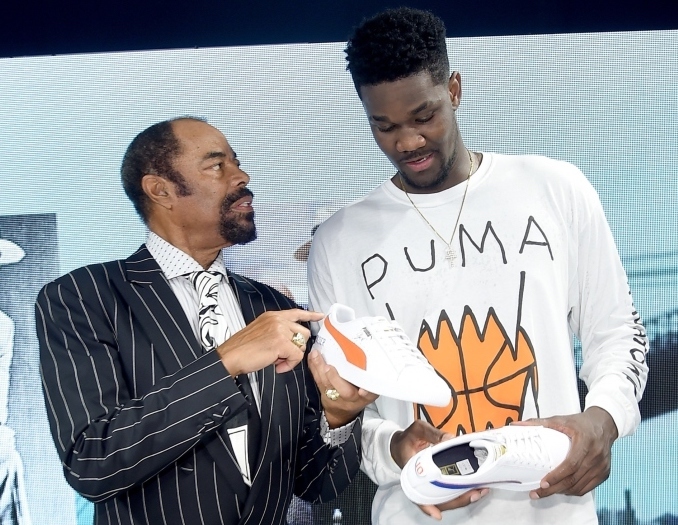 Puma also honored basketball legend Walt “Clyde” Frazier with a lifetime contract and hired Jay Z as creative director to help guide basketball marketing. Blizzard/Tecnica announced the hiring of Christian Avery as national product manager. U.S. Ski & Snowboard, the Olympic national governing body for ski and snowboard sports in the U.S., announced that Mark Schneider has joined the organization as chief technology officer. Eco-conscious footwear brand Saola Shoes announced the addition of several experienced and respected independent sales reps, rounding out representation in all key U.S. regions. Backpack manufacturer Granite Gear has promoted David Eisenberg to creative manager. C-A-L Ranch Stores Companies Inc. appointed Tom Yearsley as chief executive officer. Brock Leonardson is the new chief financial officer and Mandi Dyer is the new general merchandise manager. CrossFit Inc. and Beyond the Whiteboard have signed an exclusive agreement to link the data-driven fitness company with a software platform that will help CrossFit athletes and affiliates maximize their results. Land and Water Conservation Fund champions in the House and Senate rallied on the steps of the U.S. Capitol with conservation leaders and outdoor recreation advocates on June 20 and vowed to save America’s conservation and recreation program, the Land and Water Conservation Fund (LWCF), before it expires in 100 days. Point6, the family-owned manufacturer of merino wool socks, appointed two new representatives to manage sales and retailer relations in key territories. Nordic sneaker brand Arkk Copenhagen announced a multimillion-dollar (USD) Series A deal with Copenhagen-based Friheden Invest and North-East Venture. PacSun announced that Alfred Chang has been named president. Chang was most recently PacSun’s executive vice president of men’s merchandising & design and chief brand officer. California-based accessories brand Raen announced the appointment of Vice President of Sales & Marketing Scott Chantos and Director of Sales Adam Quick. Puma signed NBA draftee Michael Porter Jr. and Rudy Gay of the San Antonio Spurs. Canada Goose Holdings Inc. announced that certain of the company’s shareholders, including certain of the company’s executive officers and directors, intend to offer for sale 10 million subordinate voting shares. Puma confirmed that Romelu Lukaku, international football star, has chosen to sign a long-term partnership with Puma Football. Adidas announced a multiyear partnership with 2017-18 Calder Trophy (Rookie of the Year) finalist Mathew Barzal of the New York Islanders. Vista Outdoor Inc. announced that Joshua Waldron will serve as president of the company’s Blackhawk business unit. Nite Ize named Brenda Isaac as vice president of marketing, Jen Bryan as vice president of customer experience and Dale Karacostas as vice president of innovation. Wieden+Kennedy named Andre Gustavo as group brand director, responsible for leading the company’s Nike account globally. Even with the threat of wildfires and a nebulous economic outlook, western mountain destinations are coming off a strong spring and are on pace for yet another record-setting season of lodging performance, according to Inntopia. Alterra Mountain Co. entered into an agreement to purchase Solitude Mountain Resort in Utah, which would bring the company’s total to 13 year-round mountain destinations throughout North America, including the world’s largest heli-skiing operation. Peloton, the in-home cycling studio specialist, announced Peloton Digital, an expanded Peloton iOS app providing even more options for members to work out anytime, anywhere. BSN Sports and Stack Sports, formerly Blue Star Sports, have partnered to develop a digital platform that offers team sales integration across all facets of youth sports from ordering customized team apparel and athletic equipment to on-field participation. Timed to the NBA Draft, New Era Cap Co. presented “The Path to the Cap,” an exploration of NBA star and 2015 NBA Draft second overall pick D’Angelo Russell’s journey from neighborhood baller to NBA professional athlete. The Boston Celtics, New Balance Athletics and NB Development opened the Auerbach Center at New Balance World Headquarters as the team’s official practice facility. GoPro Inc. announced that Ty Ahmad-Taylor, vice president of product marketing at Facebook, has joined GoPro’s board of directors. The University of Memphis and Nike have agreed to a five-year extension valued at more than $2 million per year. Adidas signed NBA draftees Trae Young and Lonnie Walker IV to endorsement deals. Fjällräven welcomed vice president of sales Matthew Hershey to the North American team. Arc’teryx Equipment Inc. announced that Megan Cheesbrough and George Weetman have been promoted to the company’s senior leadership team effective immediately. Adam Ketcheson, VP global marketing and B2C, has left the company. Lacoste will launch an exclusive Olympic Heritage lifestyle apparel collection as part of a new partnership with the International Olympic Committee. Gander Outdoors, formerly known as Gander Mountain, is now open in Eau Claire, WI. Goat, a leading marketplace for authentic sneakers, announced the appointment of Lizzie Francis as the company’s first COO. Francis will report to CEO and co-founder, Eddy Lu. Fleet Feet tapped Fish Consulting as the company’s public relations agency of record to lead the brand’s communications strategies. Columbia Sportswear Co. and the Oregon Department of Transportation have teamed up to clean up Highways 26 and 405. A new pilot program to supplement litter removal along the Sunset Highway was funded by Columbia Sportswear CEO Tim Boyle. Foot Locker partnered with NBA draft picks Trae Young and LiAngelo Ball on an integrated marketing campaign. Nike pulled an apparel collection line done in collaboration with Los Angeles-based Undefeated after being accused of copying the US Naval Academy’s coat of arms. Aside from the more common goals that people try to achieve by working out, such as weight loss and building muscle, the findings from Freeletics, the fitness app, show fitness is key for general self-development and leading a goal-oriented life. Four members of the American Sportfishing Association (ASA) were elected to fill two at-large seats and two regional seats on the board of directors. The Associated Press reported Sunday that the New Hampshire attorney general, Gordon MacDonald, told the governor a state department must sign off on Vail Resorts Inc.’s proposed takeover of the Mount Sunapee Resort ski area. NRI Distribution has hired Jason Brooks as general manager, NRI East. Brooks will be based in Montreal and lead NRI’s East Coast operations. Bridgestone Golf, a manufacturer of golf balls, clubs and accessories, has appointed Dan Murphy as president and CEO. Gearhead Outfitters has opened the company’s 11th store at Utica Square in Tulsa, OK. The Finish Line Inc. and JD Sports Fashion Plc announced that they have completed their merger. Untuckit, the apparel brand, announced the company’s newest investor, Drew Brees, the quarterback of the New Orleans Saints and entrepreneur. Deckers Brands announced the appointment of Steve Fasching to chief financial officer effective July 16, 2018. Ebay kicked off the company’s first-ever community sneaker drop, inviting enthusiasts everywhere to list their most coveted pairs. As part of the drop, select styles at special pricing will be able to purchase direct from Adidas, Stadium Goods and Reebok, all with free shipping. Sport Town in Spokane, WA, is closing by the end of July. Sports Page, the sporting goods store in Altoona, IA, will close at the end of August, according to a report from the Des Moines Register. Converse has tapped IPG Mediabrands-owned Initiative to handle the company’s global media planning and buying, according to Advertising Age. Sportsman’s Warehouse is opening in Anderson, SC. The store will be the company’s second Sportsman’s Warehouse location in the state of South Carolina. Revolve, the Los Angeles-based high-end apparel e-tailer, is planning an initial public offering of shares for late 2018, according to various reports. In an e-mailed note to members, Rich Harper, manager of international trade at the Outdoor Industry Association (OIA), said the organization was pleased that apparel, footwear and travel goods were not included in the retaliatory tariffs announced by President Trump on June 15. Macy’s Inc. announced that Naveen Krishna will be appointed chief technology officer. Lululemon Athletica announced that, on June 21, the company will donate 100 percent of profits from the company’s in-store and online sales to benefit non-profit groups that increase access to yoga and meditation for communities that face barriers to well-being.